The Licensing Journal is the leading source of in-depth, practice-oriented licensing guidance by top attorneys in intellectual property, computer technology, and entertainment law. Published ten times a year, it contains valuable strategies, cautionary tips, and creative approaches to structure the most lucrative and secure licensing deals. 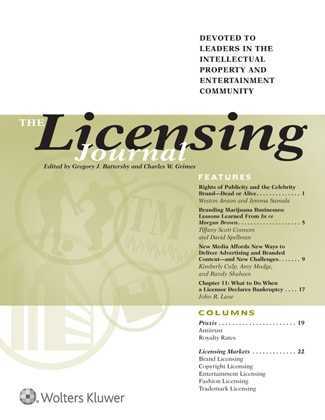 The Licensing Journal features regular columns on licensing in: character; corporate; sports; collegiate; and toy and hobby markets. Plus ongoing, in-depth coverage of critical developments in trademark law, licensing around the world, royalty rates and the latest business developments. No other journal covers so much ground to keep you on top of the licensing scene. There's No Risk. Your satisfaction is guaranteed! You may cancel your subscription at any time and receive an unconditional refund for all unmailed issues.